Can you see the 2's among the 5's? 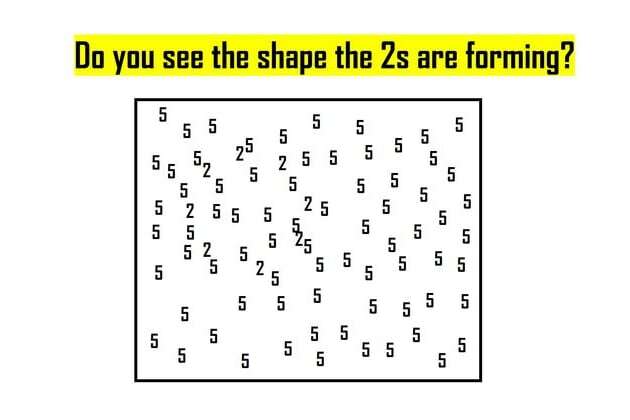 Which shape do they form? Which shape do the 2's form? And finally, do you see the word? You were able to see all the special shapes and letters the 2's formed among the 5's. This means your brain is wired in a unique way which allows you to see, smell, feel and understand what most people can't. You have the personality of an artist. You are adaptable, tactile, creative and observant. You're a master improviser and you have a natural gut instinct that you can always trust. Either way, you're unique and truly a breath of fresh air. Your senses are sharp and absolute! - And this is exactly what made you excel in this test! You are an abstract and objective thinker. You seek knowledge and logic. You strive to learn as many subjects as possible and you have an incredible knack for strategic thinking. You're most likely tech savvy, down to earth, and very reliable. As a rational, you also excel in any kind of logical investigation. You either tend to be an attentive mastermind and use your intelligence for coordinating people and things or you're a true architect at heart with incredible intellectual potential. You don't seek attention and you are not concerned with being liked. You are comfortable in your own skin and always tell the truth - in the most polite and respectful way possible. You don't like deceiving or tricking others and drama is the last thing on your mind. Have you heard of Synesthesia? It's a phenomenon of a sensory interplay when a person has a rare ability to "smell shapes", "hear letters", see numbers as colors and more. This sample test can determine whether you have this special skill.